The sub-$500 price point opens up just a few options for the casual gamer, with almost nothing for the serious. Once in a while though, a truly exceptional bargain comes along, especially during the pre and post-holiday shopping rush. It comes from a brand known to deliver outstanding features that define what it means to have a gaming laptop for the masses. With a bargain basement price of $449.99 last advertised in Amazon from a list price of $580 and $415 when used, this ASUS K55N-DB81offers an excellent choice among the few budget laptops worth considering as a gaming laptop. Casual gamers on the road will not be disappointed while serious gamers who put a higher premium on affordability will likewise get a thrilling gaming laptop for a song. Click here to buy the K55N-DB81. 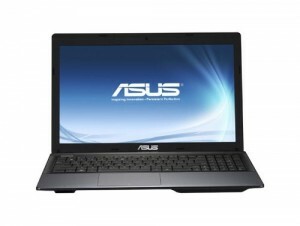 This Asus model sports a modest low HD screen resolution of 1366 x 768 for a typical 15.6-inch display. It is powered by the AMD A8-4500M running at 1.90GHz and supported by a 6GB DDR3 system RAM. While not marketed as a gaming laptop, what qualifies this humbly specified mobile PC that could easily win casual gamers is its graphics engine – the AMD Radeon HD 7640G. It’s a mid-tier Class 3 Category GPU integrated into the A8 CPU and takes a slice of the system RAM for its video RAM. It offers reasonable gaming muscle just slightly better than the Intel HD Graphics 4400 integrated in some Haswell CPUs and is certainly a few steps more capable than the HD Graphics 4000 which establishes our minimum GPU threshold to qualify a mobile computing device as a gaming laptop. Under the hood, the ASUS K55N-DB81 is powered by a 3rd generation quad core AMD Trinity A-Series A8-4500M clocked at 1.90GHz and supported by a 6GB DDR3 system RAM. It comes integrated with the Radeon HD 7640GAMD through a dual-channel memory architecture sharing with the system RAM. AMD has never really been able to catch up with Intel in terms of processing power, though users find their lower operating temperatures friendlier for a sustained hours of use and offer a more wallet-friendly cost for the same processing power. While it enjoys the same performance level as the Intel Celeron, laptops with the AMD A8-4500M chipset are generally cheaper. . Nevertheless, what really matters for a gaming laptop is the GPU, as most laptops today are sufficiently powered on the CPU side to handle most sophisticated games that take advantage of the multithreading multicore architectures. Table 1 below provides a snapshot of how the A8-4500 compares with other CPUs. Take note that the quad core i7 has more than 4 times its processing power on the Cinebench R10 tests. The graphics of ASUS K55N-DB81 is driven by a modest Class 3 Category AMD Radeon HD 7640G which is integrated into the A8 CPU. So don’t expect it to have any dedicated video RAM which it shares with the 6GB DDR3 system RAM. As introduced above, this GPU gives the Asus K55N model a good enough gaming muscle equivalent to that offered by the Intel HD Graphics 4400 integrated in some Haswell CPUs and is more capable than the HD Graphics 4000 we consider the minimum GPU to qualify a mobile computing device as a gaming laptop. 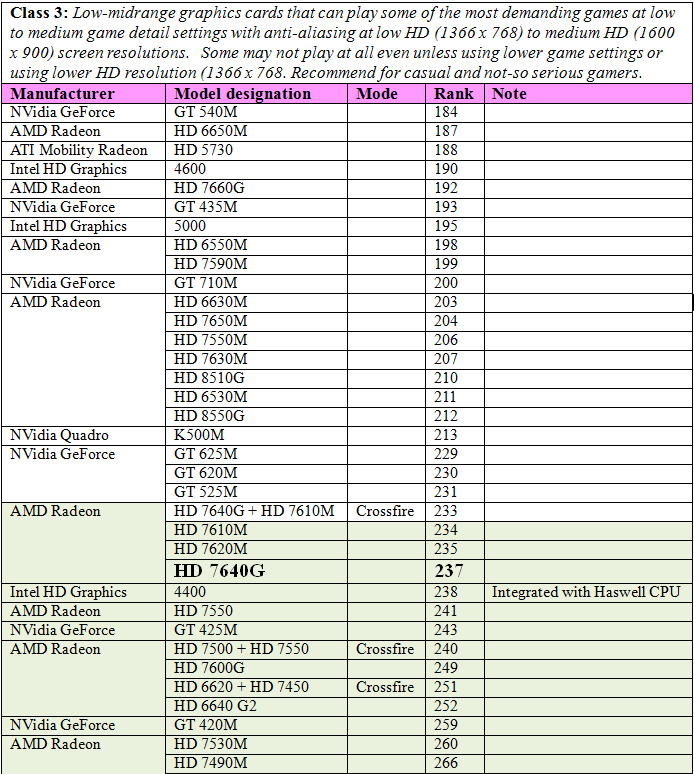 The table below provides a snapshot of what we consider as Class 3 graphics cards and the relative position of the AMD Radeon HD 7640G relative to the Intel HD Graphics 4400 and its superiority to our minimum Intel HD Graphics 4000. Click here to know more. Table 2: Some of the laptop graphics cards in the Class 3 category above the Intel HD Graphics 4000 Threshold with those commonly used for laptops in the $500 price point highlighted. Highlighted rows indicate models of graphics cards that may be found in Laptops in the sub-$500 price point, those most available on the market are often configured with the Intel HD Graphics 4000. Casual gamers can play some of the more demanding RPG and FSP games at the low to medium game details at the default or lower screen resolution. Don’t expect Company of Heroes 2, Assassin’s Creed IV: Black Flag, Crysis 3, Metro: Last Light, or Hitman: Absolution to play smoothly on this machine while some might not even play, especially Company of Heroes 2. However, Fifa 13/14, Counterstrike: Go, and SIM3 will play at high game setting while games like Tomb Raider, Dota 2, Diablo3, Anno 2070 and the older World of Warcraft can play from low to medium. Table 4 below presents a snapshot of the how the laptop plays the recent game tittle releases. Most would play at low game setting with some in the medium setting. The older games released earlier than 2011 should have no problem playing from medium to high game setting. The ASUS K55N-DB81offers a typical LCD widescreen with LED backlighting. The 15.6-inch display has become a display size standard used in more than half the laptops available in the market. With a screen resolution of 1366 x 768, you get the minimum HD resolution and is just the right default resolution when playing many of the resource-intensive RPG and FPS games in the market using Class 3 GPUs. It matches the modest integrated GPU which makes playing games in mid-high HD resolution (1600 x 900 and 1920 x 1080) useless anyway at any screen size. The K55N-DB81 is one of our best seller – click here to buy it . Without a dedicated GPU which is a power hungry element in just about all serious gaming laptops, this Asus K55N model runs relatively cool to the touch. But Asus has done more. Its IceCool heat management technology incorporated into this model appears to be doing a good job at keeping it cool even when used over prolonged periods tethered to the AC wall socket. But gaming does take its toll on any laptop in terms of getting maxed out in draining the battery. The ads for this model say you get 5.5 hours or thrice the battery life of typical laptops before the next battery charge. However, this is true only when working on some MS Word document for your college thesis. You’d be lucky to get three hours on straight gaming. Not bad when playing World of Warcarft or Sims 3 while taking a 3-hour bus ride to another city or a short flight to another state. The company’s SuperBatt Technology touted to lower voltage consumption could well be doing the job right in extending battery life. This is still better than most serious gaming laptops which typically average only around 1-1.5 hours on straight gaming. Though this is not really a problem as most gamers often carry a spare battery or two when on the road. The other advantage in the Asus laptop technology used in this model is that once the battery reaches just 5% of its life, data gets automatically backed-up. Theoretically then, should you miss out the warning, there is little risk that data would be lost when the battery dies on you. In addition, the ASUS Super Hybrid Engine II technology can be configured to support a 2-second wake-up from sleep mode, allowing you to just idle the laptop without turning it off, up to two weeks. Storing your games should not be a problem with a relatively generous 750GB SATA drive running at the standard 5400 rpm. If that’s not enough, the manufacturer offers a modest 32GB free cloud storage for three years. It’s a $49 value which you can start paying on your 4th year if you elect to continue using it. It’s possible the rate could go down by then. Though within that time period, you could already be in the market for a new and possibly pricier and more powerful, more featured laptop. The ASUS K55N-DB81uses the Chiclet type keyboard which is getting fairly standard in most laptops at whatever price point. It is not back-lighted so it won’t be great to use for word-processing in the dark. But one nice touch is the textured palm rests around the keyboard which offers a sure traction to your hands without leaving messy sweat prints from your palm in an otherwise glossy finish. Not many though, will be happy with a Chiclet type keyboard. Neither would the track pad be something to be happy about. Good thing most laptop users accustomed to the desktop PC would not mind spending a few more dollars for a more responsive external mouse. And there are several specialized gaming mouse that amateur and professional gamers prefer to use. The display is not the best we have seen, but at this price point, one can’t expect superlatives to abound in any of its feature set. Suffice to say that the 15.6-inch widescreen display with its matte finish offers better contrast and color temperature when used in broad daylight than some laptops with glossy screens and costing more. Reflections are kept to a minimum. But neither is it something to write about, other than to say it gets the job. If you don’t compare it with some of the best displays in upscale laptops, it offers good enough color brilliance to keep you happy. The ASUS K55N-DB81 is clearly engineered as an excellent laptop in terms of processing power and dependability, aesthetics and a reasonable gaming muscle for the budget-conscious. At less than $500, this Asus model defines what “bang for the buck” means and repositions what a real “workhorse” is for the casual gaming student or professional who has loads of documents and spreadsheets to process, several high resolution images to edit in Photoshop, or a few HD movies to watch on the side. The 6 GB RAM, large 750 GB SATA drive, optical drive and excellent power management are above what you can find in most other laptops at this price range. Its processing muscle beside, the main advantage is its power management and cool operation. Add a cost avoidance benefit of not having to purchase a cooling gadget often resorted by laptop users, or a second battery if you don’t see yourself playing a game beyond 3 hours. Finding another 15-inch laptop in the same weight, cool operation, feature set, and gaming muscle as this Asus model at its price point would be a real challenge, unless you are prepared to go down to the 13-inch screen size or accept compromises in the memory and hard drive capacity. If you like to play the most resource intensive game titles released so far, don’t bother setting your budget at this level. Save up to as least thrice this much. But for most practical people looking for the best value for the money, looking any farther than the ASUS K55N-DB81is, in our opinion, an unnecessary waste of time. You can buy the K55N-DB81 here.